The day had finally arrived for the Israelites to possess the land that God had promised. But just like He had taught them lessons throughout their journey in the wilderness, He had more to teach them, as they possessed the promise. And so it is for us. Possessing the promise doesn’t mean the faith adventure has come to a conclusion; rather, in many ways, it has only just begun. Possessing the promise will involve in some respects an even greater dependence upon God and the promise He has given you. “Possessing the Promise” chronicles the stories, experiences and lessons we see recorded in the books of Joshua and Judges in sixty-one “bite-sized” chapters. The book has been formatted for one chapter to be read each day for sixty-one days. Explore this third book in the “Lessons Learned In The Wilderness” series and allow God to use it to teach you how to possess the promise as He leads you in the journey with Him each day. AVAILABLE TO PURCHASE AS AN E-BOOK FOR YOUR KINDLE, APPLE, NOOK, KOBO OR ANDROID READING DEVICE, OR AS A SOFT-COVER PRINT BOOK BY CLICKING ONE OF THE BUTTONS BELOW. 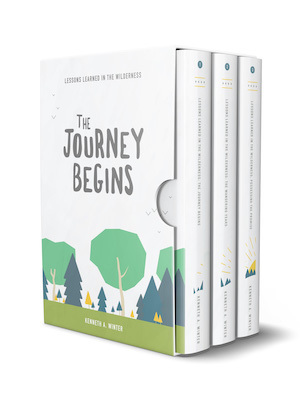 For a limited time, the first three books in the Lessons Learned In The Wilderness series are available as an e-book collection in a boxset at a significant savings through Amazon. Where can we send your e-book? Enter your email address to get a free copy of The Journey Begins e-book delivered to your inbox. You’ll also be added to my Readers’ Group with updates about new releases, etc. You can unsubscribe at any time. Thank you for joining! An email with a link to download your book is headed your way.